This inertia of things is enough to drive one literally insane. Samuel Beckett is famously one of the most recondite of writers, especially in speaking about his own work. Yet, in the one of paradoxes of modern literature, his work has spawned millions of words of scholarly exegesis. 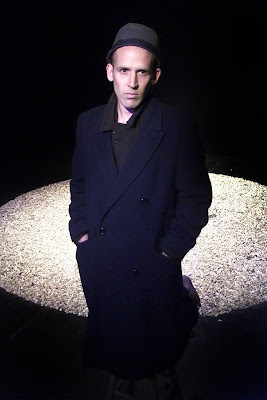 I’d swap much of this commentary for this performance by Conor Lovett: his bitterly lucid performance of extracts from Beckett’s trilogy of novels – Molloy, Malone Dies and The Unnamable – tells you everything you need to know about Beckett, that isn’t said by Beckett himself. Lovett’s performance reveals Beckett’s humility, that ironic compassion and obdurate, sly humour. There isn’t a trace of vanity in these cruelly comic narratives, built precariously before our eyes “to pass the time”. Lovett and his director, Judy Hegarty Lovett, wisely don’t attempt to summarise all the novels into what is already a marathon (three and a half hour) performance. Instead, they select a few passages from each work and structure the evening as a fragmentary progression. For those unfamiliar with the trilogy, it's an excellent introduction; for those who have already read them, it's a joyous exploration of a work that remains as freshly challenging as when it was written. Beckett's characters enact powerlessness. Most obviously, it's at the hands of mysteriously intentioned others: the bafflingly charitable, who insist their charity on the benighted whether they desire it or not; or those who insist some kind of claim of obligation, perhaps the accidental death of a dog; or the policeman who embodies an irrational social order. Just as often, they are at the mercy of things: bicycles, trousers, trees, their own bodies. Yet, with a very human irrationality, if Beckett's characters have power of their own, they will exert it on others, and their actions are as cruel and absurd as those they suffer (less evident perhaps in this performance, than in the novels). For Molloy and Malone, these encounters are merely symptoms of a brutal interior impotence, in which the self is in an unavailing struggle with itself. They are fictions who know they are fictions: and the hand that structures the writing, the author himself, despairingly sees himself in their inadequate mirrors, a thing of language at the mercy of the imperative of living, a drive for survival that is no more than a primitive instinct for continuation. It's in the clarity of this vision - as disinterested as a natural historian's - that Beckett's compassion is most evident. Most of all, these characters are alone, in a wasteland bounded by the limits of their skulls. Through the three books the fictions narrow and focus, until the nameless protagonist of The Unnameable begins to grapple with the act of speech itself, tormentedly unsure whether he is saying the words or whether the language is saying him, his consciousness nothing but a series of predestined patterns in which individual choice is nothing but a fragile illusion. "Hearing nothing, I am nonetheless a prey to communication. And I speak of voices! After all, why not, as long as one knows it's untrue..."
The chief virtue of Lovett’s performance is how he embodies the struggles of Beckett’s absurd and tragic characters, in their struggle to exist and to remember; most of all, in their struggle out of silence, towards speaking. Dressed in dark clothes that change subtly for each recitation, he emerges from the audience for both Molloy and Malone Dies, as if to emphasise that these stories do not concern themselves with those who live in the limelight, but with more ordinary, anonymous lives. Speaking in a soft Cork accent, Lovett’s white face and fluttering hands articulate the cruel intelligence and surprisingly gentle ironies that animate the writing. Perhaps the performance is most powerful in its silences, which are impeccably timed, permitting the implications of what has been heard to flower vividly in the mind. The staging is pleasingly bare. For the first two, a white circle of light snaps open on a huge, naked stage. We contemplate the light for some moments, until Lovett emerges from the audience and onto the stage. The Unnamable is staged in a narrowly angled blade of light that throws a monstrous shadow on the wall behind Lovett, and is more sober, more painful, than the preceding two. I find it hard to judge this last one: a migraine of titanic proportions clamped down on my skull, making being present at this performance a real struggle. Despite this, Lovett kept my attention, and somehow the physical pain seemed strangely appropriate for witnessing this anguished conflict with language and consciousness. Perhaps it was Beckett playing a final, mordant joke. A shorter version of this review is in today's Australian. The Beckett Trilogy: Molloy, Malone Dies and The Unnamable, by Samuel Beckett, writings selected by Colin Lovett and Judy Hegarty Lovett, directed by Judy Hegarty Lovett, performed by Conor Lovett. Gare St Lazare Players Ireland. Playhouse Theatre, Victorian Arts Centre. October 15. Sorry about your migraine in Part 3. it was the hardest part to watch even just battling fatigue (NOT caused by the production!) It seemed he'd been burnt away to the merest flicker of naked humanity, without picturesque distraction. Appalling & heartbreaking. The change in setting was inspired. Thanks Chris - I've often thought that what is most horrible about physical pain is how it nails you absolutely in the present: you cannot escape it. And the kinds of pain that Beckett deals with in the Trilogy, and especially in The Unnamable, is absolutely about that inescapable present-ness. So, like I said, it was strangely right. Still, in all this, I wonder if I've said enough how funny the first two acts were. Comedy is a cruel thing. I saw this on Saturday night - though in my case the only migraine was from the badly-behaved audience (thankfully by act three only the truly committed remained). Interestingly, I thought this condensation of the Trilogy was closer in spirit to Beckett's original than Barry McGovern's 'I'll go on...'. McGovern's seemed to cherry-pick the most entertaining/hilarious passages from the novels and play it for the laughs, with the existential dread appearing almost as an afterthought. Lovett's version better showed the gradual unravelling of the narrator, and as such it cut a bit deeper with me. disjointed the narrative eventually becomes. McGovern had this to a 'T'. By comparison, Lovett's humanistic interpretation kind of softened the absurdity of the text for me. But I agree with you, his use of silence was masterful, and worth the price of admission. this is an interesting review but it doesn't attend to two of the key aspects of the show, the humour and the theatricality. theatricality: i'd been unsure about what to expect in the lead up to seeing it: the old fuddy-duddy in me cried "when such a brilliant fellow wrote plays a-plenty, why must you put the novels on stage? why not leave them as they are?" this is not only a poor attitude in general, but it was completely undermined by the direction and the performance. this lovett is clearly some kind of genius. plus, he can mime! doesn't putting the whole thing on stage draw attention to the importance of theatre as a metaphor/analogue/situation of great significance to m. beckett? well, the performance that i saw had the entirety of the audience in hysterics for much of the time. in fact, the same old conservative inside me i mentioned ealier found it annoying when trying to cogitate on the metaphysical weightiness of the whole thing. this annoyance dissipated on reflection. there is a line about this very phenomenon in the novels somewhere which someone may recall. the only one i can remember is nell's in endgame though: "Nothing is funnier than unhappiness, I grant you that. Yes, yes, it's the most comical thing in the world. And we laugh, we laugh, with a will, in the beginning." he always puts it better. Thanks for the comments - Hugh D, sadly, I missed Barry McGovern's interpretation. I have a recording of the brilliant Jack MacGowran reading from The Unnamable, which generates a kind of a kind of rhythmic panic, light and barely disturbing the surface, vertiginous I guess, quite different to Lovett. Yes, Anon, so much to speak of and always more to say (although to be fair, I do spend a bit of time describing the staging and performance and theatricality of this show - the theatricality is, as oyu say, in the performance.) I agree, the show was hilarious. At least for the first two parts. But I've always thought Beckett funny, although, as The Unnamable shows, he isn't always. I've written at length of Beckett in the theatre on this blog - maybe the most interesting is a review of some of his later short works. I too was there on Saturday and perplexed by the hijinks in the audience but mesmerised by the performance (despite having just returned form an exhausting interstate tour). The humour and theatricality were indeed profound elements in this brave experiment. And much more subtle and effective I feel than in the recent 'Godot' tour which seemed to me more forced (but I've complained of that elsewhere). The words felt like they deserved to be addressed to us in person, not merely read, which I find a remarkable feat in itself. The 'charm' of the performance was indeed disarming allowing the terror to unleash itself unexpectedly. I too missed the McGovern performance but was more than pleased at the approach taken by this version. (It has 'made' my Festival so far.) Yes, the shift in the final section was indeed masterful and the balance between humour and dread throughout most finely poised.